"Casa Jade" near San Jose, Ibiza, sleeps 14 people. 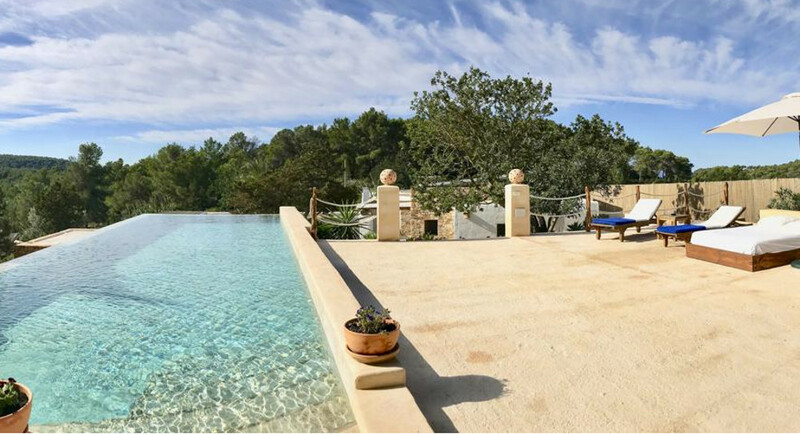 Casa Jade is a large, 300 year-old, villa in Ibiza's countryside. The villa is perfect for groups of friends and family as it's split into 3 separate properties - so you can holiday together; but also apart! The main house sleeps 4 people, and has 2 bedrooms - a king-size double bedroom and a twin bedroom. Both bedrooms are en suite. With the separate guest house having 2 king-size double bedrooms. With booth bedrooms being en suite. The second guest house 3 bedrooms, with all bedrooms being twins. Two of the bedrooms here are en suite. The main house is where you'll find all the amenities. The living room has a large satellite TV & DVD player, and an iPod dock. There is a dining area suitable for 14 people. The kitchen has a cooker, microwave, fridge/freezer, dish washer and a washing machine. You have Wi-Fi at Casa Jade too. Outside you have two swimming pools: a circular 6 metre pool and a 15 metre infinity pool (as seen in the photo below). You also have sun loungers, a garden, and a covered outdoor kitchen. There parking for 15 cars too! There is a Spar supermarket 250 metres from Casa Jade; with the bars and restaurants being a short walk from Casa Jade too. The beach at Cala Vadella is 9 kilometres. Ibiza Airport is 10 kilometres from Casa Jade. Ibiza is the bottom, geographically speaking, of the three Balearic islands. Located just off the Spanish mainlandm and sitting in the Mediterreanan Sea, Ibiza has some groovy beaches, beautiful secluded bays, and some impressive sun scorched countryside. Casa Jade is indeed in Ibiza, specifically in the San Jose, region; and well worth a look. if Casa Jade doesn't suit your needs, there's plenty more villas to choose from on this this little island. Just have a look at the other villas on Ibiza.